Donald Trump Releases Health Records A letter from Donald Trump's personal physician says he is in "excellent physical health" and weighs 236 pounds, which, at a height of 6'3" puts him at the high-end of what is considered overweight. 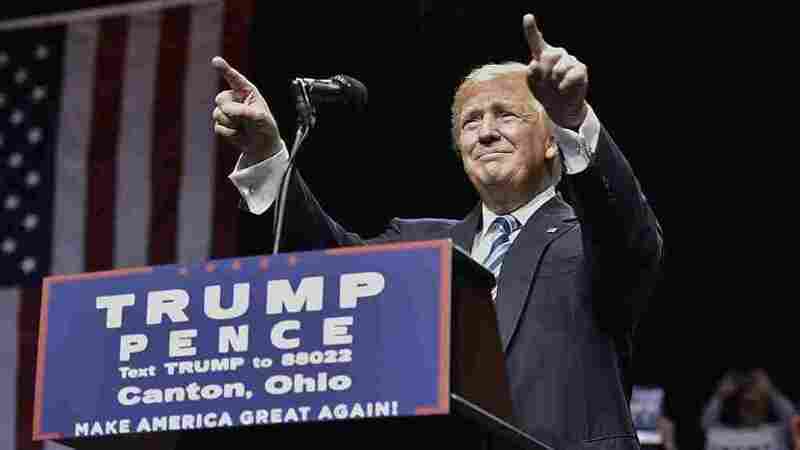 Republican presidential nominee Donald Trump speaks during a rally in Canton, Ohio, on Wednesday. A letter from Donald Trump's personal physician says he is in "excellent physical health" and received normal results after a physical examination last week. The GOP nominee's campaign released the one-page summary from Dr. Harold Bornstein, an internist and gastroenterologist at Lenox Hill Hospital, on the same day an interview with controversial TV host Dr. Mehmet Oz is airing. Trump reviewed some of his medical history on The Dr. Oz Show, which he taped on Wednesday. The 70-year-old weighs 236 pounds, according to his doctor. That, at a height of 6'3", puts him at the high-end of what is considered overweight — just shy of being obese.. Lab results in the letter show normal levels of cholesterol and blood sugar. Trump is taking a cholesterol drug known by the brand name Crestor and he takes a low-dose aspirin. His PSA is very low, which suggests little risk for prostate cancer. A colonoscopy done in 2013 was normal, according to Bornstein. A chest x-ray and electrocardiogram (ECG) in April were normal, and an echocardiogram in 2014 was "within the range of normal," Bornstein wrote. The letter from Bornstein is much more straightforward and professional than one he wrote for Trump in December 2015, in which he bizarrely proclaimed that Trump "would be the healthiest individual ever elected to the presidency." Bornstein admitted last month he had written the letter in five minutes while a limo sent by Trump waited outside. The more comprehensive release from Trump comes a day after his rival Hillary Clinton released a letter from her doctor explaining her recent health history. The Democratic nominee's own health has been under scrutiny as she's been recovering from a bout of pneumonia. Clinton is set to return to the campaign trail today after a three-day absence, and her physician wrote that she is "recovering well with antibiotics and rest." In the press release with Trump's medical results, his campaign took a veiled shot at Clinton, noting the Republican was healthy enough to campaign "uninterrupted." "We are pleased to disclose all of the test results which show that Mr. Trump is in excellent health, and has the stamina to endure — uninterrupted — the rigors of a punishing and unprecedented presidential campaign and, more importantly, the singularly demanding job of President of the United States," the email said. Trump also took a swipe at Clinton's health during a rally in Canton, Ohio, on Wednesday night, telling the crowd, "You think Hillary would be able to stand up here for an hour and do this? I don't think so."